People have been asking for it, so I have decided to give it a try. Each month there will be TWO opportunities to come and reserve a spot at a table and work on unfinished projects (this is NOT a class…there will be no instruction, but assistance will be available). 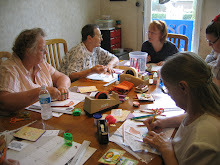 What you work on (scrapbooking, card making, unfinished “stuff”) is up to you and the charge is $5.00 per session. The Rent-A-Table days will be held on the first Thursday and/or the second Sunday of each month. There will be a morning session (10:00am – 1:00pm on Thursdays and 11:00am – 2:00pm on Sundays) and an afternoon session (2:00pm – 5:00pm on Thursdays and Sundays). Participants may register for one or two sessions and may bring lunch and snacks to stay fueled. PLEASE NOTE: For the month of February ONLY, this will NOT be available on the SECOND Sunday but on the THIRD Sunday due to a scheduling conflict.